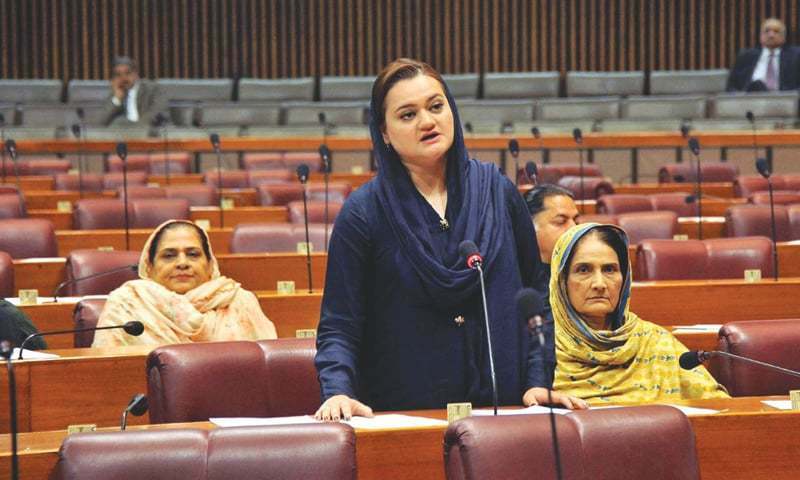 Building on the prime minister’s criticism of judicial activism in the National Assembly, the government on Tuesday continued to bolster its stance for parliamentary supremacy, with Minister of State for Information Marriyum Aurangzeb reiterating the call for an ultimate parliamentary debate on the powers of state institutions. Speaking on matters of public importance, the minister said that when the courts would pass “weak judgments” like the one in the case of former prime minister Nawaz Sharif, these would be criticised. “To criticise the judgment is my right and it is also the right of Nawaz Sharif,” she added. The minister’s speech at the fag end of the sitting on a private members’ day is a clear indication of the ruling party’s changed strategy of using the floor of parliament for criticism of the judiciary under the cover of Article 69 of the Constitution which bars courts from inquiring into proceedings of parliament. The Pakistan Muslim League-Nawaz (PML-N) has apparently changed the strategy after the Supreme Court announced that it would show no leniency towards those committing contempt of court. The court had already convicted ex-senator Nehal Hashmi, besides issuing notices to federal ministers Daniyal Aziz and Tallal Chaudhry.